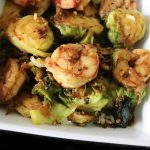 Sriracha Maple Brussels Sprouts is my favorite seasonal side from DigInn. I love it so much that I created this copycat recipe on my lifestyle blog a few years back. Well I took the recipe to the next level, and added juicy five spice seasoned shrimp to create this Sriracha Maple Shrimp & Brussels Sprouts Stir Fry. I absolutely love a good stir fry. It’s one of the easiest meals to throw together when you don’t have a lot of time. It’s also a great way to clean out the fridge and make use of produce that’s on the brink of going bad. I was not a fan of Brussels sprouts as a child, along with mushrooms and okra. I love all of these things as an adult though. Well at least the sprouts and mushrooms. With okra it depends on how it’s cooked. Anyway, Brussels sprouts is now a go to side dish in my house. Especially when pan roasted in a cast iron skillet. My teen son even loves them. Even if you’re not a fan of Brussels sprouts, this recipe may change your mind. 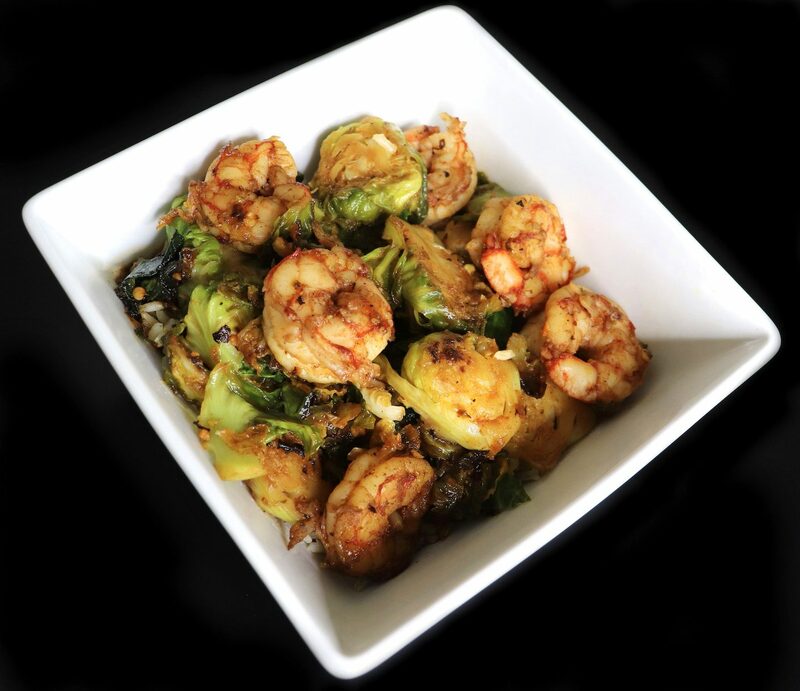 The shrimp and sprouts pair perfectly with the sweet & spicy Sriracha Maple Sauce. Serve over jasmine rice or rice noodles! 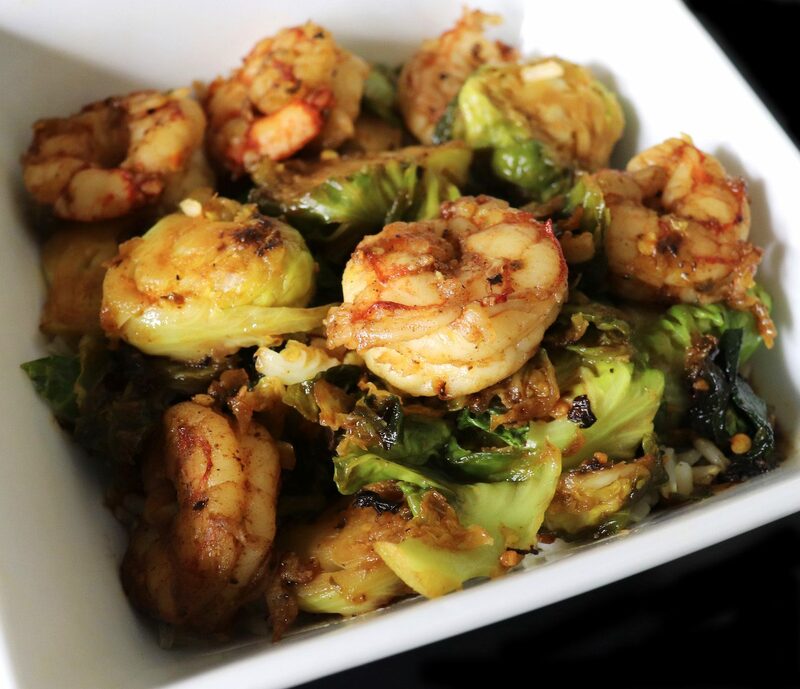 Juicy Shrimp & Brussels Sprouts Stir Fry, in a Sweet n’ Spicy Sriracha Maple Sauce. Rinse the jasmine rice thoroughly. Add rice with 1 1/2 cups of water to a small pot. Cover and cook on low. Set aside. Wash & devein shrimp (if necessary). Pat dry and season with the five spice powder, salt & pepper. Set aside. Wash and drain the Brussels sprouts. To slice, first chop off the stems and discard. Then chop each sprout into two or three pieces. Heat a cast iron skillet or wok, and add the olive oil. Add the Brussels sprouts to the pan, and roast until brown and slightly tender. Make sure you stir every few minutes so that they all brown evenly, and don’t burn. Heat a separate pan and coat with olive oil, and saute the shrimp until done. Then add the shrimp to the pan with the brussels sprouts. To make the sauce, mix the maple syrup, sriracha and chili garlic sauce in a small dish. If your spice tolerance is low, leave out the chili garlic sauce and add less sriracha. Add the sauce to the pan with shrimp and brussels sprouts, and stir fry until everything is coated evenly and heated through. 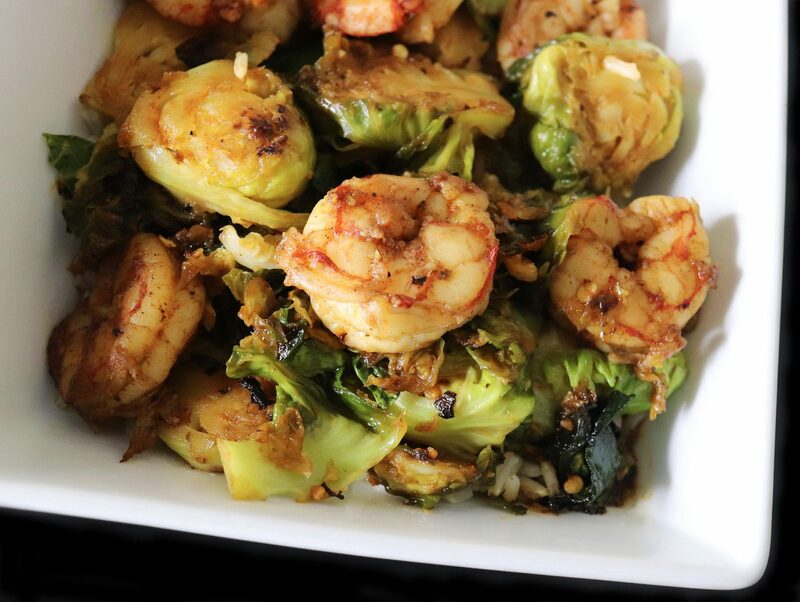 Serve the Sriracha Maple Shrimp & Brussels Sprouts Stir Fry over jasmine rice. Enjoy. You can find frozen Argentinian Red Shrimp at Trader Joe’s.